For many, Leonard Whiting will be forever best known for playing the male lead in Franco Zeffirelli’s superlative 1968 film of Romeo and Juliet, whereas Jean Simmons’ career was so long and varied that it would be difficult to pin-point one defining film performance. Alvin Rakoff’s whimsically charming Say Hello To Yesterday pairs the two in an intriguing mix of swingin’ permissiveness ‘neath the shadow of responsibility, both domestic and social. 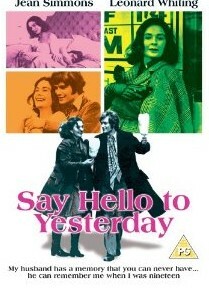 From the outset, Say Hello To Yesterday promises much- the gloriously fluid cinematography from maestro Geoffrey Unsworth (whose c.v. also included Becket and 2001, A Space Odyssey) providing a priceless time-capsule of Britain at the turn of the 1970s. Indeed, the natural locations underscore the tensions between Whiting’s character (intriguingly unnamed throughout) and his Father. The latter is as dominated by his work as the family’s town (Cobham) is dominated by the ethos of work- Unsworth shows this by framing the characters as being dwarfed by first the giant cooling towers and then by the factory- we last see Whiting’s Father entering his workplace totally dominated by his environment. The vibrant freshness of the cinematography continues throughout the film, and is as irrepressible as Whiting’s character. Also playing an unnamed character, Jean Simmons excels in a performance of refined class, the perfect foil for Whiting’s laddish exuberance. ‘You’re not playing the game’, she tells him at one point, prompting his immediate response ‘I’m not sure of the rules’. To a great extent this applies to the film itself- nothing is ever certain, no moves predictable or clichéd. Although this can be a great strength (the film never becomes boring) this wavering structure and rather oblique character motivation (which some might argue is essentially human) will not be to everyone’s taste. However, it is surely impossible not to be utterly charmed by the altercations early on in the film yet somewhat chastened by the way they develop as the film moves towards its denouement. All in all, Say Hello To Yesterday is a great little film- quintessentially British, boasting beautifully composed shots and set pieces (the playground and the avenue of trees to name but two), fine cameo appearances (those from veteran actress Evelyn Laye and the always-good-value Geoffrey Balydon stand out), and a narrative that, for all its twists and turns, is perpetually fascinating. In chronicling the many weaknesses of humanity the film is successful, not only on a philosophical basis but also a cinematic one. Extras include a theatrical trailer, a feature on Jean Simmons and a commentary featuring Alvin Rakoff and a film historian. Say Hello To Yesterday is available now from Odeon Entertainment.